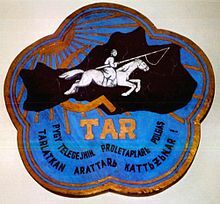 Tuvan (Tuvan: тыва дыл, tıwa dıl; [tʰɯˈʋa tɯl]), also known as Tuvinian, Tyvan or Tuvin, is a Turkic language spoken in the Republic of Tuva in south-central Siberia in Russia. The language has borrowed a great number of roots from the Mongolian language, Tibetan and the Russian language. There are small diaspora groups of Tuvan people that speak distinct dialects of Tuvan in the People's Republic of China and in Mongolia. While this history focuses on mostly the people of Tuva, many linguists argue that language is inevitably intertwined with the socio-historical situation of a language itself. The earliest record of Tuvan is from the early 19th century by Wūlǐyǎsūtái zhìè (烏里雅蘇台志略), Klaproth 1823, Castrén 1857, Katanov and Radlov etc . The name Tuva goes back as early as the publication of the Secret History of the Mongols. The Tuva (as they refer to themselves) have also been referred to as Soyons, Soyots or Uriankhais historically. The Tuvan people have been ruled by China, Russia, and Mongolia for thousands of years. Their most recent time of independence was from 1921-1944, when they were considered the Tuvan’s People's Republic. Many sources say there has been extreme tension between the Soviet Union/Russian Federation government and leaders in the Tuvan nation since 1944, when Tuva lost its independence to the USSR. In 1990, violence broke out between Tuvans and the USSR government. According to a study completed by social scientists Louk Hagendoorn, Edwin Poppe, and Anca Minescu in 2008, the Tuvan people wanted to be as independent as possible from the Russian federation, following the collapse of the Soviet Union. They especially emphasized their want for independence in terms of their language and culture. The study demonstrates that the reason behind this was partially based on prejudice. The many minority ethnic and linguistic groups in Russia compete for economic resources and hold closely on to their individual identities, by emphasizing the importance of language and culture. Since 2000, the Russian federation has been trying to reduce separatist tendencies of ethnic minorities in Russia, but the tendencies persist. Tuvan (also spelled Tyvan) is linguistically classified as a Northeastern or Siberian Turkic language, closely related to several other Siberian Turkic languages including Khakas and Altai languages. Its closest relative is the moribund Tofa. Tuvan, as spoken in Tuva, is principally divided into four dialect groups; Western, Central, Northeastern, Southeastern. Central: forms the basis of the literary language and includes Ovyur and Bii-Khem subdialects. The geographical centrality of this dialect meant it was similar to the language spoken by most Tuvans, whether or not exactly the same. Western: can be found spoken near the upper course of the Khemchik River. It is influenced by the Altai language. Northeastern, also known as the Todzhi dialect, is spoken near the upper course of the Bii-Khem River. The speakers of this dialect utilize nasalization. It contains a large vocabulary related to hunting and reindeer breeding not found in the other dialects. Southeastern: shows the most influence from the Mongolian language. Other dialects include those spoken by the Dzungar, the Tsengel and the Dukha bands of Tuvans, but currently these uncommon dialects are not comprehensively documented. Different dialects of the language exist across the geographic region in which Tuvan is spoken. Dr. David K. Harrison, who completed his dissertation on the Tuvan language in 2001, argues that the divergence of these dialects relates to the nomadic nature of the Tuvan nation. One subset is the Jungar-Tuvan language, originating in the Altay mountains in the Western region of Mongolia. There is no accurate number of Jungar-Tuvan speakers because most currently reside in China, and the Chinese include Tuvan speakers as Mongolians in their census. The distinction between initial bilabial and alveolar stops is based on aspiration for most speakers and voicing for others. /f/ and /ts/ are found in some Russian loanwords. Vowels in Tuvan exist in three varieties: short, long and short with low pitch. Tuvan long vowels have a duration that is at least (and often more than) twice as long as that of short vowels. Contrastive low pitch may occur on short vowels, and when it does, it causes them to increase in duration by at least a half. When using low pitch, Tuvan-speakers employ a pitch that is at the very low end of their modal voice pitch. For some speakers, it is even lower and using what is phonetically known as creaky voice. When a vowel in a monosyllabic word has low pitch, speakers apply low pitch only to the first half of that vowel (e.g. [àt] 'horse'). That is followed by a noticeable pitch rise, as the speaker returns to modal pitch in the second half of the vowel. The acoustic impression is similar to that of a rising tone like the rising pitch contour of the Mandarin second tone, but the Tuvan pitch begins much lower. However, Tuvan is considered a pitch accent language with contrastive low pitch instead of a tonal language. When the low pitch vowel occurs in a multisyllabic word, there is no rising pitch contour or lengthening effect: [àdɯ] 'his/her/its horse'. Such low pitch vowels were previously referred to in the literature as either kargyraa or pharyngealized vowels. Phonetic studies have demonstrated that the defining characteristic of such vowels is low pitch. See Harrison 2001 for a phonetic and acoustic study of Tuvan low pitch vowels. In her PhD thesis, "Long Vowels in Mongolic Loanwords in Tuvan", Baiarma Khabtagaeva states that the history of long vowels is ambiguous. While the long vowels may originate from Mongolic languages, they could also be of Tuvan origin. In most Mongolic languages, the quality of the long vowel changes depending on the quality of the second vowel in the conjunction. The only exception to this rule is if the conjunction is labial. The ancient Tuvan languages, in contrast, depended upon the first vowel rather than the second to determine the long vowels. Khabtagaeva divided the transformation of these loanwords into two periods: the early layer and the late layer. The words in the early layer are words in which the Mongolic preserved the conjunction, the VCV conjunction was preserved but the long vowel still developed when it entered the Tuvan language, or the stress is on the last syllable and a long vowel in the loanword replaced a short vowel in the original word. The Late Layer includes loanwords in which the long vowel does not change when the word entered Tuvan. Vowels may also be nasalized in the environment of nasal consonants, but nasalization is non-contrastive. Most Tuvan vowels in word-initial syllables have a low pitch and do not contrast significantly with short and long vowels. Vowel harmony in Tuvan is exhibited in its phonology, subject-object-verb word order, head-final syntax and heavy use of multiverb constructions. Tuvan has two systems of vowel harmony that strictly govern the distribution of vowels within words and suffixes. Backness harmony, or what is sometimes called 'palatal' harmony, requires all vowels within a word to be either back or front. Rounding harmony, or what is sometimes called 'labial' harmony, requires a vowel to be rounded if it is a high vowel and appears in a syllable immediately following a rounded vowel. Low rounded vowels [ø] [o] are restricted to the first syllable of a word, and a vowel in a non-initial syllable may be rounded only if it meets the conditions of rounding harmony (it must both be a high vowel [y] [u] and be preceded by a rounded vowel). See Harrison 2001 for a detailed description of Tuvan vowel harmony systems. Tuvan builds morphologically complex words by adding suffixes. For example, [teʋe] is 'camel', [teʋe-ler] (hyphens indicate morpheme boundaries) is 'camels', [teʋe-ler-im] is 'my camels', [teʋe-ler-im-den] is 'from my camels'. Tuvan marks nouns with six cases: genitive, accusative, dative, ablative, locative, and allative. Each case suffix has a rich variety of uses and meanings, only the most basic uses and meanings are shown here. Verbs in Tuvan take a number of endings to mark tense, mood, and aspect. Auxiliary verbs are also used to modify the verb. For a detailed scholarly study of auxiliary verbs in Tuvan and related languages, see Anderson 2004. Tuvan employs SOV word order. For example, [teʋe siɡen tʃipken] (camel hay eat-PAST) "The camel ate the hay." Tuvan vocabulary is mostly Turkic in origin but marked by a large number of Mongolian loanwords. The language has also borrowed several Mongolian suffixes. In addition, there exist Ketic and Samoyedic substrata. A Tuvan talking dictionary is produced by the Living Tongues Institute. The current Tuvan alphabet is a modified version of the Russian alphabet, with three additional letters: ң (Latin "ng" or International Phonetic Alphabet [ŋ]), Өө (Latin "ö", [ø]), Үү (Latin "ü", IPA [y]). The sequence of the alphabet follows Russian exactly, with ң located after Russian Н, Ө after О, and Ү after У. The letters Е and Э are used in a special way. Э is used for the short /e/ sound at the beginning of words while Е is used for the same sound in the middle and at the end of words. Е is used at the beginning of words, mostly of Russian origin, to reflect the standard Russian pronunciation of that letter, /je/. Additionally, ЭЭ is used in the middle and at the end of words for the long /e/ sound. The letter ъ is used to indicate pitch accent, as in эът èt 'eat'. In the past, Tuvans used Mongolian as their written language. Mongolian script was later developed by Nikolaus Poppe to suit the Tuvan language. This is the first known written form of the Tuvan language. Example of Latin-based alphabet on the Tuvan People's Republic coat of arms. It says "PYGY TELEGEJNIꞐ PROLETARLARЬ POLGAŞ TARLATKAN ARATTARЬ KATTЬƵЬꞐAR". The Latin-based alphabet for Tuvan was devised in 1930 by a Tuvan Buddhist monk, Mongush Lopsang-Chinmit (a.k.a. Lubsan Zhigmed). A few books and newspapers, including primers intended to teach adults to read, were printed using this writing system. Lopsang-Chinmit was later executed in Stalinist purges on 31 December 1941. PYGY TELEGEJNIꞐ PROLETARLARЬ POLGAŞ TARLATKAN ARATTARЬ KATTЬƵЬꞐAR! Бирги тыва дылдың үжүктери Бүгү телегейниң пролетарлары болгаш дарлаткан араттары каттыжыңар! First Tuvan language alphabet All the world's workers and oppressed peoples, unite! By September 1943, this Latin-based alphabet was replaced by a Cyrillic-based one, which is still in use to the present day. In the post-Soviet era, Tuvan and other scholars have taken a renewed interest in the history of Tuvan letters. There is no official transliteration standard for transforming the Cyrillic-based Tuvan alphabet into Latin. Common schemes in use by various media sources rely upon international standards for transliterating other Cyrillic languages such as Russian while scholars of Turkology generally rely upon common Turkic-styled spelling. ^ Hammarström, Harald; Forkel, Robert; Haspelmath, Martin, eds. (2017). "Tuvinian". Glottolog 3.0. Jena, Germany: Max Planck Institute for the Science of Human History. ^ Nettle, Romaine, Daniel, Suzanne (2000). Vanishing Voices. New York, New York: Oxford University Press. ^ [permanent dead link] Todoriki 2011: 234–230. ^ a b c Mawkanuli, Talant (1 July 2010). "The Jungar Tuvas: Language and national identity in the PRC". Central Asian Survey. 20 (4): 497–517. doi:10.1080/02634930120104654. ^ "Let me hear your khoomei ringing out; Tuva's cultural history". The Economist. 46. ^ a b c "Support for Separatism in Ethnic Republics of the Russian Federation". Europe-Asia Studies. 60 (3). ^ a b c Harrison, K. David. (2001). "Topics in the Phonology and Morphology of Tuvan." Doctoral Dissertation, Yale University. (OCLC catalog #51541112). ^ a b "Long Vowels in Mongolic Loanwords in Tuvan". Turkic Languages. 8. ^ Voinov, Vitaly. (2013). "Politeness Devices in the Tuvan Language." Doctoral Dissertation, University of Texas, Arlington. ^ "Tuvan Talking Dictionary". tuvan.swarthmore.edu. Retrieved 28 September 2015. ^ Cf. Otgonbayar Chuluunbaatar: Einführung in die mongolischen Schriften. Buske Verlag, Hamburg 2008, ISBN 978-3-87548-500-4, S. 70. "Daher wurde der Sprachforscher Nikolaus Poppe von der tuwinischen Regierung mit der Entwicklung eines für die eigene Sprache geeigneten Alphabets beauftragt. " ^ Mänchen-Helfen, Otto (1992). Journey to Tuva. Los Angeles: Ethnographics Press University of Southern California. pp. 133n. ISBN 978-1-878986-04-7. ^ Mongush, M. V. "Tuvans of Mongolia and China." International Journal of Central Asian Studies, 1 (1996), 225–243. Talat Tekin, ed. Seoul: Inst. of Asian Culture & Development. Anderson, Gregory D. S.; Harrison, K. David (1999). Tyvan. Languages of the World/Materials 257. Lincom Europa. ISBN 978-3-89586-529-9. Mänchen-Helfen, Otto (1992) . Journey to Tuva. translated by Alan Leighton. Los Angeles: Ethnographic Press University of Southern California. ISBN 978-1-878986-04-7. Wikivoyage has a phrasebook for Tyvan.